No doubt, having children is one of the greatest blessings in one’s life. But great blessings come with great responsibilities. Allah has entrusted the parents with the obligation of upbringing their children according to Qur’an and Sunnah. Our children are an amaanah of Allah and we’ll be asked about them in the hereafter. Therefore, parents must make an exceptional effort to guide their children to the right path. We put great emphasis on following a proper school routine for our kids. But, we often neglect the Islamic routine for them. Raising your child to be not only a good human being but a better practicing Muslim as well, seems like a daunting challenge indeed. So we have discussed below some practical tips to help you in raising your kids with Islamic values in shaa Allah. Kids learn everything by imitating adults. So instead of preaching through words alone, you should be practicing however you want your children to act. Set an example for them to follow. Nobody else’s example is as effective as yours. When they are young, you are their only role model. So make yourself a person who reminds them of Allah. The one with sabran jameela. Teach them to recite Qur’an by reciting it to them yourself, and read out loud short Surahs and duas to them, which they can memorize. Take them with you to mosques, attend the halaqaas with them, give charity in front of them (to encourage them to do the same). Be kind and obedient to your parents to set an example in front of them. Encourage them to be honest, grateful, and hard working. Show them the virtues of good deeds by your own example. Isn’t it amazing how children can help you become a MUCH better human being…Alhamdulillah! Besides fulfilling your duty as a parent, make as much dua as you can, because sometimes practicing Muslims can have kids that are non-practising and vice versa. So seek help from Allah that they can be successful in both this life and the hereafter. And what better duas are there than the ones mentioned in the Qur’an. Feel free to print out a FREE DUA LIST and dua for the protection of children (from evil eye, satan and all things harmful). Young children are extremely malleable. You can shape them the best way when you start sooner than later. With time, the roots grow strong and instilling life-long habits may become really hard. Start praying salah with your kids before they turn 7. Make it a part of life, like eating, drinking, and sleeping. It will help them get into the habit of it in shaa Allah. And as meditation is highly recommended by psychologists nowadays, prayer can be a great way to connect children with their inner-self and help them stay more peaceful and calm as a result. And what better meditation there is than the salaah. Kids already love following you when you are praying, so might as well include them as an active part of it. Although, make sure not to instruct them all the time. Instead, teach them through practicality. If you haven’t listened to Hisham Al Awadi’s series “Children around the Prophet“, then we highly recommend you do. It will help you understand the masnoon dealings with the children. Respect your children. Don’t humiliate them or insult them (especially in public). Using sarcasm or making fun of a child is an unacceptable behavior in Islam. Involve them in useful activities around the home and seek their opinions on important matters. It will help them feel responsible and independent. Islam does not stop us from having fun. Plan fun activities with your kids such as picnics, camping and hiking trips. Take part in Islamic celebrations and festivals. Teach them swimming etc. Enroll them in healthy extracurricular activities so that they can spend their time constructively rather than wasting it in front of TVs. Even cartoons nowadays have a lot of violence, music, and explicit content in them which is not suitable for children at all. 1: Ali Huda TV (A monthly subscription streaming service (“Netflix for Muslim Kids” as they call it) including several Islamic Programs like: Scrapbook Island, Once upon a time, Learn Arabic with ousratouna, Madrassah tv , Activ8, Quran4Kids, Misri bunch, The prophets of Islam, 5 pillars of Islam, The Muslims, Know the creation etc. (all of the programs mentioned are music-free). Use the code “AYEINA” to access both your free 7day trial and 50% off of the first month. 2: One4kids(Zaky (the famous teddy bear) – they have recently launched their TV – a monthly subscription streaming service as well – which is way better than YouTube as it contains so many ads and unnecessary recommendations around the actual content). 5: The Little Muslim (great for teaching basic Arabic to kids or even learning it yourself – The channel has English/French versions as well). 6: Productive Muslim (they are not exactly children’s cartoons, BUT kids can love the simplicity of them nonetheless). 7: FreeQuranEducation (again, not exactly children’s cartoons but they are animated lectures (of Ust.Nouman Ali Khan) which can appeal to elder kids). 8: Moral Vision Kids (Please note that not all of their clips are music-free). For Arabic ones, We formed a Pinterest board (Arabic Cartoons for Kids (Without Music)) (which we will keep updating in shaa Allah) instead of a YouTube playlist because YouTube keeps showing irrelevant ads in between and weird suggestions around. Sometimes, totally inappropriate. P.S. The American Academy of Pediatrics recommends that children should watch no more than two hours of TV per day after two years of age, and none before that age. Making your kids learn Quran and Salah is the easier part. The challenging part is teaching them the right values so that they turn out to be good human beings in the future. Never force your children to follow an Islamic teaching by putting fear in their hearts. Don’t use Allah as a scare tactic. Although fear is important as well but at a young age, it may be hard for kids to understand that concept. Instead, tell them that Allah loves them way more than you (as a parent) do. And when they see nothing but love from you, the awe of Allah’s love will ascend without any push or force. Always connect before you correct! Focus on wrong behavior than branding the child wrong altogether. Instead of saying you are a liar, tell them that lying is wrong. The act of lying is displeasing to Allah. Tell them what they did wrong, why it’s wrong and how to right that wrong. Give them replacements. So when you feel angry (which is very natural), follow THESE steps. Apart from being a role model yourself by trying to practice Islam as much as possible, make sure you provide Islam to children in different forms – righteous company, reading material about the Prophet Muhammad (ﷺ) and his Companions (Sahaba) etc. Otherwise, they’ll make celebrities their role models. Friends can have a strong influence on one’s personality. So try hanging around pious mates yourself and their friends will eventually be from that company too. Show interest in what they do – their hobbies, interests, friends, and education etc. So you can understand what approach to take in their spiritual growth as all kids are different individuals with different God-given talents and nature. Every day, take out some time for reading the translation of Qur’an, stories of the Prophets, lives of the Sahaabah and Islamic story books so that they understand their religion better. Read out to them yourself. Your own knowledge will have a significant impact as well. You can go through a list of Islamic Bookstores around the world to see what kind of educational material will work best for your child! Your child should feel comfortable enough to come and speak with you. It’s not enough to show them by giving them things, keeping them safe, or feeding them. Children require acknowledgment through words just like we like love expressed through words as well. Invite them to sit and share their stories about school, passions, dreams and so on. Remember, how Yusuf (as) came to his father narrating his dream and how Ya’qoob (as) advised him accordingly. The Prophet (ﷺ) said, “When a man loves his brother (for Allah’s sake) let him tell him that he loves him”. [At- Tirmidhi and Abu Dawud]. Simplest yet most effective of all – spend quality time with them. According to Harvard psychologists, one of the secrets to raising a good kid is by spending time with them. Spending time with your children means putting everything down, reading a book, playing sports with them, hiking, or just playing an old-fashioned hide and seek. In simplest terms, it means that you interact with your kid person-to-person. They will forget what you bought them but they will remember such things. You can’t instill values in your children if you aren’t there for them. Alter your work schedule to be with them as much as possible. Messenger of Allah (ﷺ) said: “He is not one of us who shows no mercy to younger ones and does not acknowledge the honor due to our elders”. [At- Tirmidhi and Abu Dawud]. Try not to compare your children with anyone, including their siblings. Comparing can create jealousy and may put the child on an aggressive defensive mode. Plus, their self-esteem goes down to the point where they may not even want to compete in a healthy way and simply give up trying to meet the expectations. Give them the ideals of course, but comparison not only eats away their confidence but also keeps you stressed out. Always remember that Prophet Muhammad (ﷺ) never changed Abu Bakr (RA) into Umar (RA) or vice versa. Both had different nature. But Prophet (ﷺ) simply directed them both where needed instead of boxing them into one standard of acceptable good Muslim. Expose them to those who aren’t in the same social class. Let them welcome diversity. Allow them to witness how fortunate they are to have what they have at home. Teach your child to be a good listener, to be empathetic to others outside of their family, and not judge anyone based on their religion, race or language. Exposing your child to different cultures helps develop a loving, kind and happy person. Start gratitude with yourself first. Be grateful to your children. At times, showing gratitude towards your children may be hard as you may feel entitled to them and think that you have done way more than what they are doing for you. But know that whatever you did for them will be rewarded by Allah and being grateful has nothing to do with spoiling them. You are giving them dua by saying Jazakillah khair (for a girl), JazakAllah khair (for a boy) or Jazakumullah khair (for multiple children) – (meaning: may Allah reward you with khair (good)). This will not only keep you happy but also encourage them to do more good in shaa Allah. 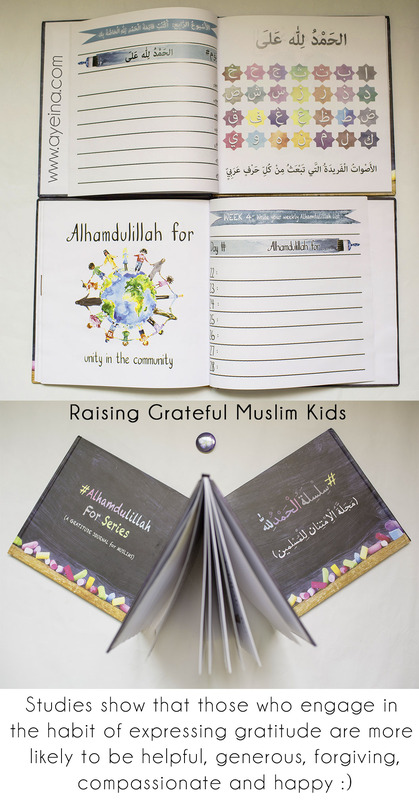 If you’d like to practice gratitude with your children – to help them be grateful for little things in life, then you can use THIS GRATITUDE JOURNAL with them – only one of a kind in the Muslim world. Alhamdulillah. Co-Author’s Bio: Lisa Zahran is a writer and copywriter who has worked with New York Times bestselling authors and personal development organizations such as Productive Muslim and Mindvalley. As CCO at Quran Academy, she’s authored a transformative ebook that can help make Quran memorization easier and more meaningful in your daily life. Experience this ebook plus a 14-day trial of Quran Companion for free today. Masha Allah well written post!! I loved each and every point. Spending time with kids, showing them our love,respect,honour, teaching Islam at the primary level. Insha Allah may He bless us to make our children the best of mankind. So very apt for me now alhamdulilah my baby just turned one and I am slowly trying to incorporate duas into our daily lives. May Allah bless us to raise our children in the best possible manner, khair for themselves, for us and for society as a whole. Perfect guide to Islamic parenting. I pity some parents who are too busy teaching their kids the British accent rather than teaching them a bit about their creator and our beloved Prophet(pbuh). Islam is the pillar upon which buildings of education should be placed. Because when the roots are strong, rest will follow! In shaa Allah! Masha Allah,,good post.Each and every point is necessary to raise good Muslim kids..
Parents should spend their time, effort, and resources to help their children make the right choices for earning a living. true. Knowledge of Islamic Finance is crucial to earn a halal income. Islamic online university has a great online course on this topic! Educated parents = educated children! MashaAllah such a lovely article! This is so helpful. With regard to the islamic cartoons or appropriate cartoons for children, my daughter loves watching Omar & Hana, a malaysian-islamic cartoon for kids. it’s more of islamic songs for young children. They will have it in Malay and Arabic and will be available in English soon!